Browse through these web sites. They are packed with great information for visitors to the area. Just click on the names. We also suggest that when our guests get to town, they stop by one of the Visitors centers. You will find tons of brochures and coupons and they are very helpful with answering questions. This web site is great. 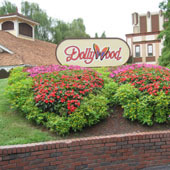 It give dates and times of operation calendars for both Dollywood and Splash Country, Ticket information for groups, Day passes and Season passes, Park maps, Events and Festivals, Entertainment, Rides /Slides and Attractions and much more. The Great Smoky Mountain National Park is part of the Blue Ridge Mountains and boarders between Tennessee and North Carolina and is the most visited National Park in the US. The Park was Chartered in 1934 by the US Congress and dedicated by President Roosevelt in 1940. The park encompasses 816 square miles making it one of the largest protected areas in the Eastern US. 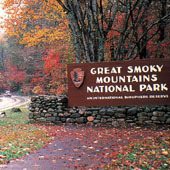 The main Park entrance is located on US highway 441 at Newfound Gap Road. Avid fans know that golfing isn't just a sport, it's a way of life! 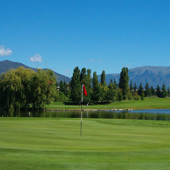 If you are looking for some unique golfing excitement, in a spectacular mountain setting, why not golf a few rounds in the Smokes. Pack those clubs and spike less shoes and indulge in your favorite pastime at one of the area's uniquely designed courses in Pigeon Forge, Gatlinburg, Sevierville, Kodak or Seymour. From challenging layouts and emerald fairways to beautifully wooded landscapes and well-manicured greens, you'll remember this picturesque setting in the heart of the Great Smoky Mountains. With so many dining options, you may have difficulty choosing. The smokes offer some of the finest "country cooking' anywhere! Whatever your dining preference, you are sure to find the perfect restaurant to satisfy your appetite. 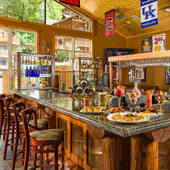 The Smoky Mountains has everything from ethnic restaurants, BBQ, chain restaurants, fine dining experiences and renowned "home-cooking". I never head back home without at least one visiting to one of many Pancake houses. 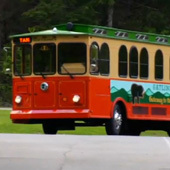 The Fun Time Trolley system in Pigeon Forge was established in 1986 to provide a convenient "hop on, hop off" type of transportation service. Today with a fleet of more than thirty trolleys the Fun Time Trolley services the city of Pigeon Forge and a portion of Sevierville. When you visit the area locate a Trolley shelter or a Trolley Bear Sign, Park your vehicle, relax, and enjoy the sites as you travel from destination to destination and let us doing the driving. 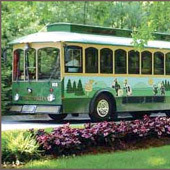 There are well over a hundred Trolley stops located along our combined routes. The weather can be very unpredictable in the mountains not only in the winter but in the summer too. 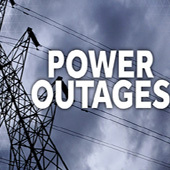 This link is an outage map that is updated every 5 minutes and shows areas which are affected by power outages in the area. SCES work hard to resolve outages as quickly and effectively as possible. There are 6 lakes and 353 rivers and other fishing spots in Sevier County, Tennessee, which makes the Smoky Mountains a fishermen's paradise. To fish in the Great Smoky Mountains National Park, you need a valid Tennessee or North Carolina fishing license. Fishing is permitted year round in the Smokes. 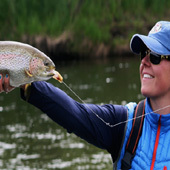 Be sure you have researched all the times in which fishing is permitted, which fish you are able to catch, sizes, and what type of lures/bait you are permitted to use thru the TWRA web site. The Smoky Mountains is a destination featuring a wide assortment of Wedding Chapels to share your vows with family and friends. Couples vacation in the area for their Honeymoon, celebrate vow renewals, or choose a Chapel as their Wedding venue. Our "Are We Bear Yet?" Cabin in Alpine Mountain village is perfect for Honeymooners. 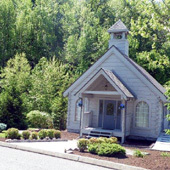 Our resort features an on -site Wedding Chapel "Sugar Hollow Wedding Chapel" which is beautiful location to say "I do". 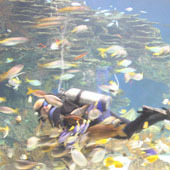 Ripley's Aquarium of the Smokes is an up-close, top rated Aquarium in Gatlinburg. Rated #5 in the world and America's #1 Aquarium and top Destination to see Penguins! Check out the Penguin Painting Program, it is truly amazing. There is also a Live Penguin Cam on this Web site. This Aquarium offers several interactive experiences and exhibits that showcase thousands of exotic sea creatures. Guests can touch and Splash with real stingrays, walk or ride along moving glide path beneath sharks, enter the ocean world face to face with thousands of fascination fish and sea creatures. You can learn about and view a wide array of species from barracudas, rays, jellyfish, moray eels, octopi, sharks and much more. The Great Smoky Mountains is a shopping paradise. There is no shortage of shopping so be prepared. From Mountain outlets, antique stores, department stores there is something for everyone.in your group. 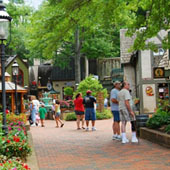 Amble along the sidewalks in Gatlinburg, and you'll discover hundreds of unique and charming specialty shops. 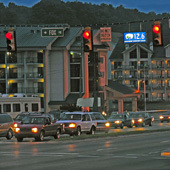 Pigeon Forge, offers several outlet shopping centers (Tangers) in addition to many specialty shops. 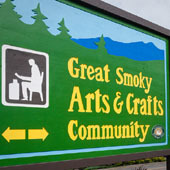 The Great Smoky Arts and Crafts Community offers handcrafted and one-of-a-kind works including watercolors, pottery, jewelry, brooms, baskets, quilts, and linens. 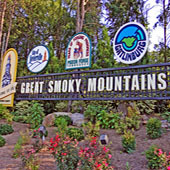 A day of shopping in the Smokey's is bound to be filled with great "finds" and memorable treasures. If you are looking to take something home that is truly unique, the Arts and Crafts Community is the place to find it. You can shop year round and there is plenty of free parking. This community is home to the largest group of independent artisans in North America. The historic 8-mile loop has been designated a TN Heritage Arts and Crafts Trail. It was established in 1937. The trail has been developed by the State in order to highlight the cultural heritage of our people. These Tennessee artists create beautiful things featuring their craft such as whittling, painting, sewing, quilting, pottery, basket weaving, candle making, painting, jewelry making, silver smiting, and carving, just to name a few. Make plans to visit this amazing Community. If you are looking for an easy way to get around Downtown Gatlinburg, the trolley system is the answer. Approximately 800,000 visitors use Gatlinburg's Trolleys annually. It is the fifth-largest Mass Transit System in Tennessee. Established in 1980 with six Trolleys, as of today, the fleet has grown to 20-plus Trolleys servicing approximately 50 miles of Trolley routes in and around Gatlinburg. With thousands and thousands of visitors in the area each year, peak season, Holiday's and Friday afternoon traffic can be daunting. During your stay, enjoy our free wireless Internet to check on traffic alerts in the area. When ever possible, it is best to try and avoid the Pigeon Forge Parkway traffic if you can. Grab area maps at the visitors center and take advantage of the "back roads" which will save you tons of time. Not sure what to pack? Planning a last minute getaway? Staying with us and thinking about taking a hike today? This link will be a lifesaver with a 10 day extended forecast. The National Park, and the surrounding areas, has elevations that range from 800 feet to over 6,640 feet. This vast change in altitude can affect weather in unpredictable ways. The valley is normally 10 to 20 degrees warmer than the upper elevations. Keep this in mind, and be prepared when hiking, in the higher altitudes. Spring time in the mountains is often unpredictable, so when going out take cold weather clothing. Summers are usually hot and humid in the valley, and more pleasant in the higher elevations. During the fall season you can expect warm days and cool nights. Light snow can occur in the mountains, so dress warm when viewing the stunning fall foliage. Winter, for the most part is relatively mild in the Smokes. When traveling through the higher elevations comes a greater chance of snow. It is possible to have snow fall in higher elevations even when it seems warm and comfortable in the valley. That said, be prepared!